A discreet poster in a Bangkok music school sets me off into the maze of dark and narrow Sois in the shadow of Ploenchit BTS station in search of the Hullu Gallery. I land up outside an anonymous looking apartment block and am directed by a bored security guard to the fourth floor. A dreary corridor opens up when the antiquated lift doors eventually open, but passing through a heavy double door, I enter upon something as wonderful as it is unexpected; gorgeous, model-like women encased within skin-tight minimalist dresses hand out glasses of champagne and, while a huge wrap-around balcony offers the chance to savour the city’s sights from a rare vantage of tranquillity, the magic is really inside where warm and soft lighting illuminates violins dotted about the walls like so many priceless sculptures and large and chunky pictures of large and chunky naked women. The pictures are intriguing if somewhat primitive, and I learn that their defining feature is that all have been created in a matter of minutes; “That one took 12 minutes from start to finish”, I overhear the artist telling someone. I’m glad it’s not me that has to respond; I would have blurted out, “It shows”. Just to visit the Hullu Gallery is pleasure enough, but what lured me there was the promise of a concert entitled “Schumann’s Women”. I’ve been to fascinating concerts called “Mozart’s Women”, “Brahms’s Women”, “Beethoven’s Women”, even “Tchaikovsky’s Women”, where programmes have been built around works written for or inspired by different women who have played roles in the composers’ lives. But I’ve never thought there was any mileage in Schumann’s Women; after all we are all fixated on the fact that the marriage of Robert Schumann to Clara Wieck was probably the most significant marital relationship in the history of art, and have never thought of Schumann in relation to any other woman. Yet he certainly was as profligate with his sexual relations as anyone, and it was his extensive network of female conquests which Herr Wieck used as a weapon to try and stop the marriage. Perhaps the most important woman in Schumann’s life was not Clara, but the unnamed maid who infected him with the syphilis from which he so spectacularly succumbed at the age of 46. As it was, the concert had nothing whatsoever to do with Schumann’s women, and was merely a performance of two of his song cycles which dealt with love as seen from a woman’s viewpoint. That said, I am still hugely glad I went, not just because of the visual delights of the Hullu Gallery, but because this turned out to be a magical recital. Swiss mezzo-soprano Liv Lange accompanied by her compatriot Luzia von Wyl may not have offered up flawless performances of Frauenliebe und Leben and Gedichte der Königin Maria Stuart - Lange possesses a voice of real strength and with laser-sharp focus, marvellous diction and superb breath control, but largely without real warmth or personality, while von Wyl, playing on a huge piano of Canadian manufacture (it had the word Heintzman emblazoned on the side which brings to mind the famous story of the “most expensive piano ever”), had her left foot so stuck to the una corda pedal that we rarely heard anything more than the desiccated tone of a single-string-per-note instrument, nevertheless revealed uncanny insight and understanding in her reading of Schumann’s deeply sympathetic piano writing - but the strengths of these performances lay in their intensely intuitive and highly intelligent interpretations which got closer to the spirit of Schumann than I have heard for a very, very long time. In a female-dominated profession (and if you don’t believe me, just attend any meeting of music teachers or look into a class of music students) it is still unusual to have an all-female lieder partnership, and there was something deeply affecting about the gentleness and grace with which these two performers approached music which can come across with a distinctly masculine swagger. With generous audience applause and spoken commentaries (captivatingly delivered by Lange) between every single song, we rather lost the thread of Schumann’s cyclic writing, but such was the depth of their obvious affection for the music that even the tiniest and most insignificant of the songs quickly created its own little sound world. 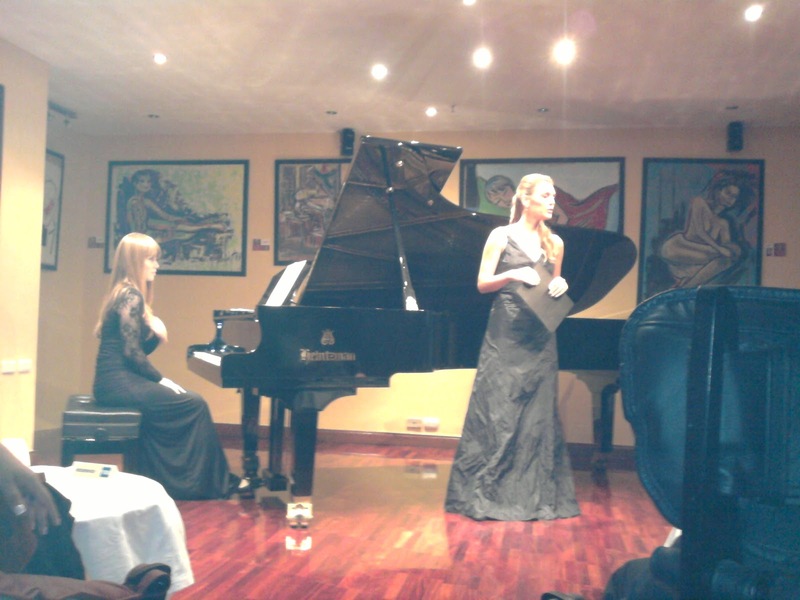 This was a lovely recital, beautifully delivered by two good musicians and in a really lovely setting. Such occasions are all the more precious for being rare, but I would urge any artistically sensitive visitor to Bangkok to root out the Hullu Gallery and its enchanting recital room. I’ve added the link to the blog for you to find the place and know what’s on.